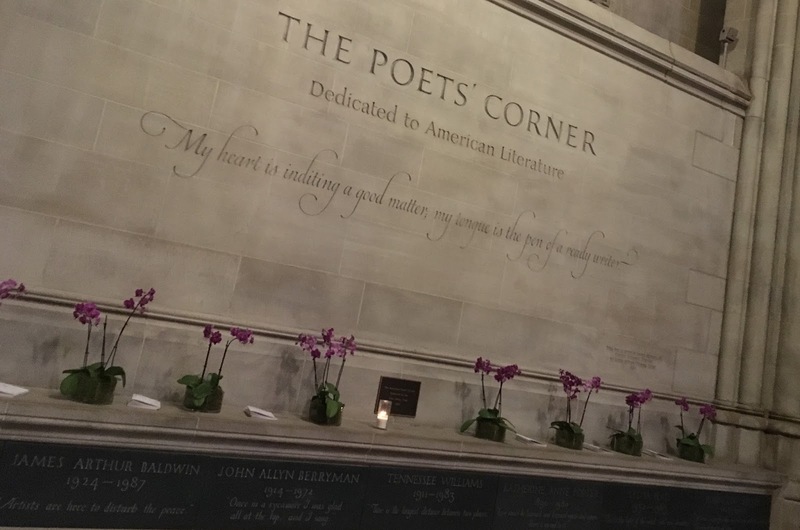 The Poets' Corner, dedicated to American Literature honors poet Jean Toomer in 2017. The poet Jean Toomer (1894-1967) was inducted into the American Poets' Corner at the Cathedral of St. John the Divine in New York City on Sunday November 12, 2017. The ceremony began with a reading of November Cotton Flower by Poet in Residence Marilyn Nelson. Toomer's literary output does not compare to past honorees but then again few American writers have been able to capture the essence of a people in a particular moment in time as Toomer did with the publication in 1923 of his incomparable book of poetry, Cane. The inscription on Toomer's plaque in the American Poets' Corner reads, "...My thoughts were matches tossed into a dark window." The line comes from a passage in Bona and Paul — chapter 28 in Cane — where Paul is talking to the doorman of the Crimson Gardens dance hall. "'I came back to tell you, to shake your hand, and tell you that you are wrong. That something beautiful is going to happen... That I danced with her, and did not know her. That I felt passion, contempt and passion for her whom I did not know... That my thoughts were matches thrown into a dark window. And all the while the Gardens were purple like a bed of roses would be at dusk. I came back to tell you, brother, that white faces are petals of roses. That dark faces are petals of dusk. That I am going out and know her whom I brought here with me to these Gardens which are purple like a bed of roses would be at dusk.'" Toomer joins the likes of Walt Whitman, James Baldwin and Sylvia Plath, writers and poets who expanded the boundaries of their art. Since 1984, the American Poets' Corner has been recognizing the giants of American literature. 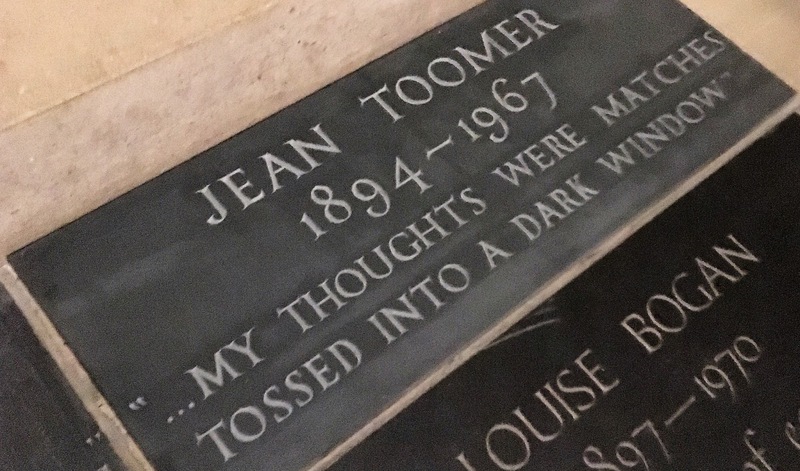 Jean Toomer is the 50th such literary giant to be so honored. A writer whose thoughts were matches tossed into a dark window to burn forever bright on the American literary landscape.